Kershaw 1600vib Kershaw Ken On..
Kershaw Chive Folding Knife Ra.. Product weight is 0.5 lbs. The Rainbow Chive features a 1 15/16 in. 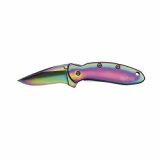 420 high carbon stainless steel, speed safe blade with finger flipper and titanium oxide rainbow coating, dual thumb studs and a 2 7/8 in. 410 steel handle with titanium oxide rainbow coating, frame lock, single position carry pocket clip and a gift tin. Made in the USA. after they designed the mechanisms that open and close knife, they should have been able to redesign so that it could have worked properly. very disappointed in that it could easily have been a neat little carry knife. instead, it is frustrating to open and close. partially opens, and is really irritating to close. aggravating! !